Sony, helping the world be that little bit more Anti-Social. Here's a new hard disc player from Sony due out in November. It's the NW-A3000 range. I like these because design wise, they're the first players I've seen that are different to the ipod - They're cool looking and don't attack you when threatened. All of the other MP3 players I've seen from iRiver,Creative or MRobe (I mean what the hell is an MRobe?) look blocky and awkward. But these lil thingys, as with the ipod, look like they came from the future'n stuff! 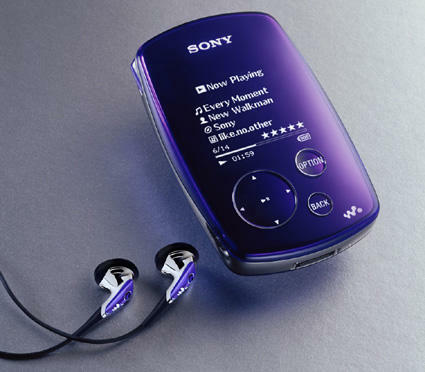 They'll come in either 20 or 6 gig size hard drives, have an OLED display built flush with the outside, and will play native Windows `wma' as well as mp3 and Sony's ATRAC3plus. They'll also have an interesting shuffle feature where you can input your own parameters as to how your songs are shuffled, ie, the Time Machine shuffle picks a year at random and plays songs from that time period. I just know I'll have some whacky one where mine brings back Benjamin Franklin who gets out of the house and goes for a ride about our neighborhood on a Fire Truck...or was that an episode of Bewitched? Coomin Zi Hirrr! Mein liebling.